Choosing the appropriate bonsai containers is important to both the health and artistic appeal of your trees. While appearance is a priority, your pots must also be functional to ensure that the root system has plenty of room and your medium stays well drained and aerated. Bonsai aims to achieve harmony, symmetry, and balance between all parts – the tree, the container, the medium, and the decorative accessories. All these aspects should complement each other to create a single representation of nature. To accomplish this, the artist will consider the color, material, size, and shape of the containers, as well as the bonsai style and form, when matching the right pot to a particular tree. There are two types of bonsai containers: training pots and display pots. Training containers are for practical purposes only and can be virtually any shape, size, or material. As long as they have large drainage holes, allow for proper aeration, and provide enough space for the roots to grow during training and pruning, you can choose anything that suits your needs and makes the developmental process easier for you. Once your tree is completed and has acquired the look and design you desire, then it is time for it to be re-potted into a display container. Again, whatever pot you choose, it must have drainage holes and a mesh screen to keep soil in and pests out. It is important that you choose a container that is in proportion to the size of the tree. If you use a pot that is too large, the bonsai will look wimpy and unimpressive. Similarly, if you choose one that is too small, your plant will look unbalanced and you could risk root damage or slowed growth. Also, your container must be able to hold enough soil or medium to accommodate the roots and allow for sufficient growth space until the tree is repotted. Generally, the design of your bonsai, the thickness of the trunk, and both the height and width of the plant are considered when determining an appropriate container. Typically, the length or width of your pot should be equal to approximately 70%, or two-thirds, the height of the tree. If your bonsai is wider than it is high, some guidelines specify that rather than using height, the pot should then be about two-thirds of the width. The depth of the container is usually determined by the diameter of the trunk, and is typically between one and two times the thickness of the trunk at its base. Also, it is important to keep in mind that the pot must be deep enough to balance the weight of the soil and tree(s) and to support the chosen style. For example, a design that trains the trunk to dip down below the base, such as cascade, will require a container with enough depth to ensure that your bonsai does not fall out of the pot. When choosing the shape and style of your bonsai container, it is important that you select one that enhances the form without overshadowing your tree. In other words, the viewers eyes should be drawn to the plant, or the creation as a whole, and the pot should not be the first thing they notice. The job of the container is to subtly enhance, not override the tree or steal the show. Your container can be square, rectangular, oval, or any number of other unique shapes. Generally, pots with straight sides, sharp corners, and angular designs are used for more “masculine” forms, or bonsai that is strong, symmetrical, and upright. 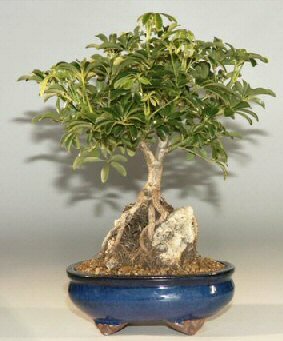 Rounded or curved containers are usually more appropriate for “feminine” bonsai with lots of sweeping branches, curves, twists, and colorful flowers. Bonsai pots are made from a variety of materials, although ceramic is the most popular, and is available in glazed or unglazed. Typically, unglazed pots are used for conifers and pine trees, while either option is appropriate for deciduous species. There are also some unique potting choices such as rock-like slabs made from concrete or reinforced plastic. These are specifically constructed for bonsai, with pockets and dips that can hold soil and provide sufficient drainage. Containers have also been designed using rocks or wood to allow for a more rustic or natural look. Earth tones such as yellow, brown, pink, or grey are the most common, and bright glaze or colors are usually reserved for flowering plants. It is best to choose a color that complements your bonsai design without being overpowering. Remember, bonsai depicts a natural event or situation, so your choice of color should fit this theme. The type of bonsai will also help determine the style of container needed. If you are growing a tree according to the formal upright form, you will likely choose a different pot than if you are growing a plant in cascading form. Other unique features such as decorative accessories or choice of medium can also help with your selection. Choosing the right bonsai container is essential to the overall aesthetic appeal and health of your plant. The species of tree, type or form being created, and your own unique touches will all affect your final selection. While there are typical guidelines about size, shape, color, and style, it is important to remember that these are not set in stone. When it comes to art, there is really no right or wrong since the creation is designed to express the individuality of the artist.